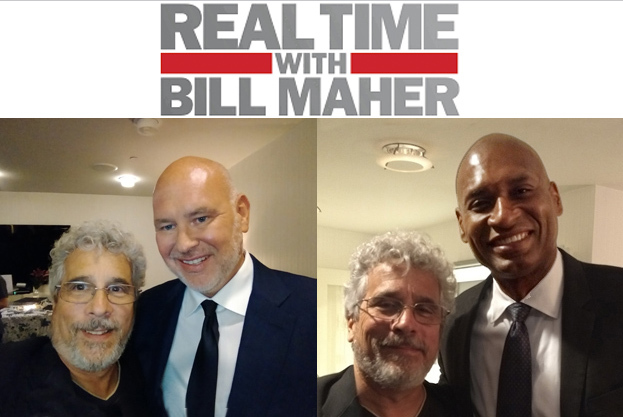 As the featured guest, my friend, Malcom Nance invited me to the August 3rd, 2018 taping of Real Time with Bill Maher. I hung out with Malcom and panelists, John McCain’s campaign manager Steve Schmidt, New York Times columnist Charles Blow and professor/author Nancy MacLean. As you might expect, the conversation was wonderfully engaging, especially that with Nancy and Bill’s fascinating producer, Scott Carter. Malcom very generously gave his valuable endorsement of my art and distributed new book to the other guests at the party who gladly accepted them. Unfortunately Bill was unable to make it to the party but Scott was kind enough to make sure he received a copy. The show itself was one of the better ones (which is a high bar) with Malcom setting the record straight concerning the danger of Trump and his allies’ attempts to shield our traitor-in-chief from justice and userp democracy. Steve and Charles gave offered their thoughts on the lack of integrity in the GOP. Nancy offered insights into the conservative movement to thwart the democratic system that have come before the Trump administration..